How does the QuickBooks Online and Zoho Inventory integration save you time? The best part of software integration is that concurrent data sync across two platforms saves time and avoids errors. Let's look at how integrating QuickBooks Online and Zoho Inventory will make it easier to manage your business data. What are the different modules that sync between QuickBooks Online and Zoho Inventory? Maintain good relationships with your vendors, and keep tabs on your payables regardless of which application you're using. Billing data gets transferred from Zoho Inventory to QuickBooks Online the moment it is created. Zoho Inventory keeps your invoicing stylish, precise, and current. Your invoices get added in QuickBooks Online the moment you create them in Zoho Inventory, so you always know which customers have yet to pay and which have already paid. You can sync your vendor data into Zoho Inventory too. When you get a quote from a prospective supplier, you can add the details in QuickBooks Online and see them automatically reflected in Zoho Inventory as well. Don't spend time syncing contacts between two different applications. 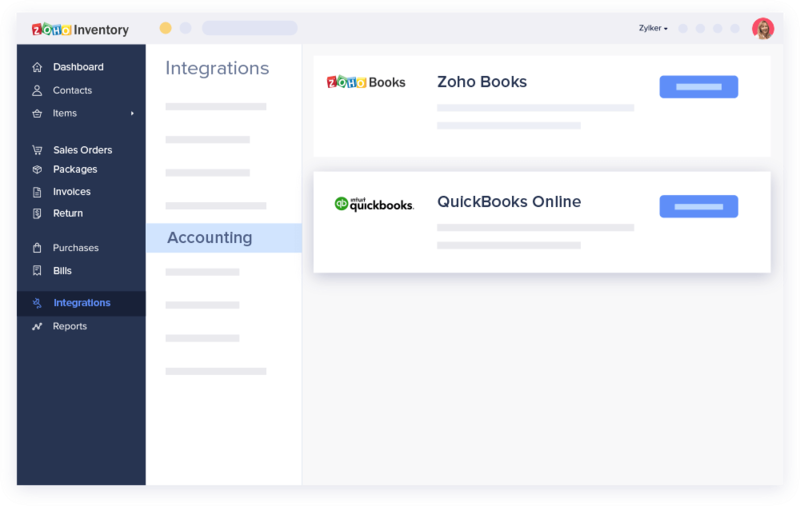 When you add a new contact in QuickBooks Online, it gets automatically added in Zoho Inventory, helping you save time while recording future transactions. How can the Zoho Inventory integration complete your inventory management process? Zoho Inventory integrates with marketplaces like Amazon, eBay, Shopify, and Etsy. The items in your online store get automatically mapped to Zoho Inventory, and your sales orders and item levels get updated at custom intervals. As your business expands, you need more space to store your items. Zoho Inventory keeps track of items in multiple warehouses, keeps your operations accurate and systematic. Using a barcode scanner with Zoho Inventory is simple and convenient. Installation involves only a few steps, and a wide range of barcode scanners are supported. Order fulfillment doesn't end with creating shipments! The Zoho Inventory and AfterShip integration allows you to notify your customers every time their packages are transferred. Zoho Inventory is integrated with more than 40 shipping carriers around the world. You can integrate your existing shipping account with Zoho Inventory, and create shipping labels without needing to log in your shipping account separately. "A great system. It has resolved all bottlenecks for small-medium business. Every step has been taken care of. We can finally focus on the market without wasting time on day to day paperwork"